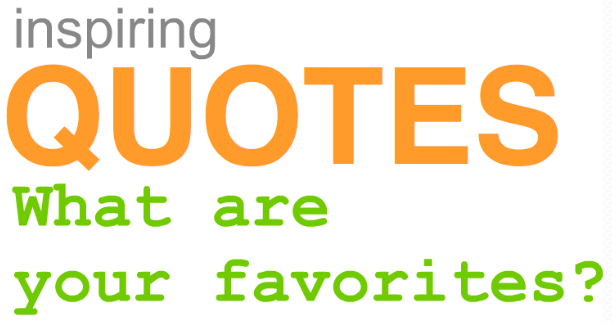 If you could pick one quote from 2011 that has been most inspirational to your business, what would it be? Thank you to the 24 entrepreneurs who shared their favorite quotes from 2011! Being a kid at heart, my favorite from the list is from Pooh’s Grand Adventure submitted by Holly Hanna (see #13), but I was touched by every single quote from the list below. As we prepare to venture forth into a brand new year, I hope you will find courage, motivation, comfort, and possibilities in this week’s submissions. If you are looking for even more, check out my post – 89 Famous Quotes that Will Rock Your World. Enjoy! As I look back over the things that came to fruition in 2011, I find vocational-gratification in having opened several new accounts. And, on the avocational -side, there was gratification in having been one of 100 artist selected to decorate the White House this year. What are some of the things that have not yet been in your life, things that you hope to see reified in 2012? It has never failed—when I’ve dared to go beyond my self-limiting fears, I find whole new worlds to explore. I find this quote inspirational because it is nice to know that working hard in business will eventually pay off! My favorite quote from 2011 has been “Innovate or Die” or as my business partner puts it, “Adapt or Die”. As an adventure tourism business that funds our nonprofit sled dog rescue, we watch the industry and constantly see that the businesses failing are the one that remain stagnant following the adage, “Take what is working and keep doing it”. In today’s economy and with today’s changing expectations from our guests… it’s important to constantly innovate by offering new adventures every season for our repeat guests and to adapt by creating new, creative things (like rolling dogsled rides) when global warming throws different weather patterns our way. For 2011 that has been my quote to live by and has served me well! Being a teacher myself, this has become my motto in 2011. However, this does not just apply for us professional teachers – because we all are teachers each and every day. Every encounter, every conversation with our loved ones, colleagues, friends, family, and especially our children, holds the opportunity to inspire them. Besides giving them unconditional love, to inspire another person is the most valuable gift we can give them. – So let us all be ‘inspiring teachers’ for one another. The world is in dire need of more inspired people who follow their dreams. ClearCause aspires to be the number one GO TO place to keep America’s children and students safe on programs abroad. We aspire to provide information to protect them that cannot be found anywhere else. We aspire to empower America’s next generation of world leaders with ‘wisdom’ at their fingertips in a SafeTY app – Safe Traveling Youth. We aspire to get much needed information into the hands of many to keep them safe in a $17 billion federally unregulated youth travel, foreign exchange and study abroad industry. Help us keep kids safe abroad – with your financial support. “Some people want all of the privileges and none of the work.” – Derrick M. Guest, CEO of Griot’s Roll Film Production & Services Inc. It takes faith (whether you believe in God or not) to get up every morning and fight the battle that is business. Faith you’ll get the business, faith you’ll GET PAID (that is the point, right?) and faith you’ll be smart enough to out fox the wolves tomorrow. At times we all experience self-doubt, and this quote reminds us that we’re so much more than we give ourselves credit for. “We may have different backgrounds, but we believe in the same dream that says this is a country where anything’s possible. No matter who you are. No matter where you come from.” – Barack Obama. This quote means a lot to me because both me and my business partner came from a communist country and made a profitable and growing business that employs folks around the world—all of whom are an integral part of our success. Entrepreneurs all have one thing in common (ok, guys have 2) and that’s balls. They don’t always have a clear idea of where they are going, or how to get there. What they do have is the gumption and the drive to finish what they started. And that means standing up to their fears, beard and all. Boy did he ever! He touched almost everyone on every continent with his creativity and innovative products that were beautifully designed and fun to use. What a wonderful legacy he left for all of us. “We’re focused on doing one thing incredibly well. If you look at other companies, all of these companies are doing a lot of different things but we’re still, as we grow, doing exactly one thing,” – Facebook COO, Sheryl Sandberg. This quote was exactly how our mentality was this year. We focus on getting people the best deals on the web. We don’t try to do anything flashy and we don’t step way out of our boundary—but what we do with our daily content is top-notch. Henry David Thoreau’s quote was a guiding force for iMADdu (I make a difference, do you?) operations in 2011. A canvas with this quote hangs in the office—a hanging reminder for us to refine our vision with each operational step that we take as a growing nonprofit. As ideas were brought to the table by new participants in the 12-week Student Apprenticeship Program, we were able to embrace change and innovation by appreciating the multiple perspectives on our team. In situations and opportunities in 2011, we became aware that our sight drove our vision. Thoreau’s quote inspires us to continually look for the bigger picture as we make a difference—to empower, inspire, and motivate more broadly than what we currently see. “The trouble with you and me my friend, is the trouble with this nation, too many blessings, too little Appreciation” – Don Henley from his song My Thanksgiving! This past year I put Appreciation into practice in my business. It started with a willing partnership who united with me in this practice. The value I created for myself, our partnership and my well-being was extraordinary. I am happy. I have exciting profitable projects, and I am making a difference with women’s lives. I am Confidence, Beauty & Joy! Appreciation is how I begin my day, a team meeting, or when I meet someone to be with. It brings so much warmth and love to everything you do, and it escalates the value of everything you do, people you meet and events you attend. Success is measured by much more than the bottom line. This is when I know I am ALIVE, PLAYFUL,PROSPEROUS & LOVE! This quote meant the world to the country and to our business. We have only been around for a few months, and in that time, we have managed to have a handful of megaprize giveaways, pump out multiple freebies for the public on a daily basis, and have generated close to 6,000 likes/followers on Facebook. And in that sense, we are really ‘Winning’. “Everyone is on the same page and putting their best foot forward.” – Wes Welker, New England Patriots. Our office is one large cohesive unit. When we work together on any project, the outcome is always incredible. Like this quote says, we all seem to be on the same page—especially this year. “You can never say all the tricks have been done. Someone always shows you something you didn’t know. Every year you think, ‘Gee, I didn’t think you could do that.” – Landon Curt Noll, a founder of the International Obfuscated C Code Contest. This quote holds true for our business because we used to be one-dimensional during the first couple of months after we launched. Ever since then, we have constantly implemented new aspects to our business. Society is always changing and so are we. Thanks so much again to all our wonderful contributors for sharing your favorite quotes from 2011! We hope to hear from you again. And to all our readers, if you have an innovative idea to share, we hope you will leave it in the comments below. This entry was written by Dr. Shannon Reece, posted on December 26, 2011 at 6:00 am, filed under Question of the Week and tagged famous quotes, inspiring quotes, quotes, small business tips, strategies for women. Bookmark the permalink. Follow any comments here with the RSS feed for this post. Post a comment or leave a trackback: Trackback URL.